This two day extended intermediate to advanced level programme will provide delegates with comprehensive training in the latest MiFID II regulatory, risk, compliance and implementation issues. 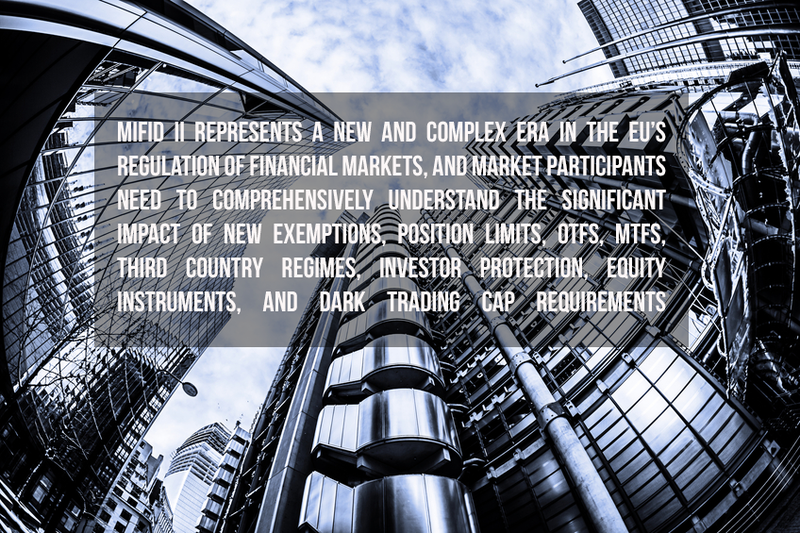 Delegates will be guided through the latest MiFID II operational framework in detail, and will be provided with a critical and explanatory review of the latest draft Level 2 texts published by the European Securities and Markets Authority (ESMA). The conference will also provide extensive guidance on the new MiFID II provisions affecting over-the-counter (OTC) and commodity derivatives, algorithmic trading, dark trades and dark pools. Stephan Hanks, Manager, Markets Policy Division at the Financial Conduct Authority (FCA) will be providing MiFID II implementation insights. Sopra Steria will be discussing their new digital regulatory market data processing platform that they are building for the FCA. The MiFIR Reporting Workshop may likely cover areas relating to FCA and market participant data feeds, MiFID II transaction reporting validation and storage, validation times, distribution sequence, the external interface specification, message types, testing, beta-testing phase, and the reporting warehouse facility. Third Country Firm legal and taxation considerations for choice of branch or subsidiary. Analysing the Level II implementing measures and curtailment of available exemptions. Revised financial instruments (emission allowances, OTF physically settled contracts). Position limits and position reporting to ESMA. Regulation on Energy Market Integrity and Transparency (REMIT) and Markets in Financial Instruments Regulation (MiFIR) equivalence transaction reporting. The latest MiFID obligations for automated trading in the EU (authorisation, market making, venue pricing, order-to-trade ratios). Execution algorithms and proprietary trading strategies adopted by high-frequency traders. Liquidity, high-frequency traders, and dark trades. MiFID II dark trading caps (reference price waiver, negotiated trade waiver) and exemptions (large in scale waiver) and the impact of MiFID II liquidity requirements on risk management policies. MiFIR reporting obligations, classification of investment firms, new reportable instruments, extended transaction report fields, Legal Entity Identifiers (LEIs) and standards. An Overview of the new FCA digital Regulatory Market Data Processing Platform (RMDPP) delivered by Sopra Steria (operational build, capabilities, timelines, cost reductions). The Interaction of the RMDPP and MiFID II and MiFIR frameworks (validation and storage of transaction reports, big data capabilities, industry beta testing phase, adjacent MiFID II opportunities). National MiFID II implementation insights by Stephan Hanks, FCA.